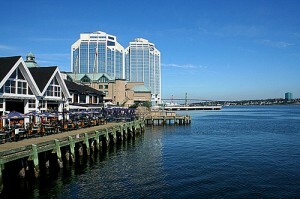 Explore Halifax and then set off to see the rest of Nova Scotia! Have 7 days to spare? Here’s what you can do in Nova Scotia with a week to work with. Wherever you go, stay in a small area. Don’t try and cover too much ground or you’ll spend most of your vacation on the road. With several weeks on your hands you can add a few of these ideas together. These itineraries assume you have your own car (travelling by bus or shuttle bus will take longer) and that you are starting and ending in Halifax. See the famous Peggy’s Cove Lighthouse and some of the scenic fishing villages and coastal areas like Lunenburg and Mahone Bay. Go as far south as Liverpool, then cross Route 8 through Kejimikujik National Park to the artistic haven of Bear River and to Digby in the Annapolis Valley where you can feast on scallops. Continue down the Digby Neck penninsula to Brier Island, an area famous for its whale watching tours. On the return leg to Halifax, stop in the lively university town of Wolfville, and the Acadian historical site of Grand-Pre. In this area you can also try some of the province’s best wines. Work your way up the rugged eastern shore on Highway 7, through Sheet Harbour and Sherbrooke Village (always popular with kids) and over the causeway at Canso onto Cape Breton Island. Take in the fantastic Alexander Graham Bell Museum in Baddeck before heading west to the Cabot Trail. 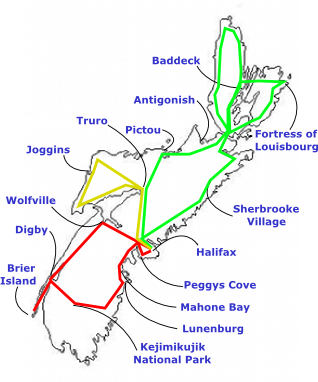 From the end of the trail, head all the way to the eastern coast of the island for the Fortress of Louisbourg. Return to Halifax on the main highway, with a break to visit the celtic university town of Antigonish and see the Hector Heritage Quay in Pictou. This one is for outdoor adventurers. Leave Halifax on Highway 102, heading for Truro. Your first stop is Shubenacadie, where you can go tidal bore rafting, a wild ride on the waves caused by this natural phenomenon. Kids will enjoy the nearby wildlife park too. At Truro, turn off the highway for Route 2 and the small towns of Five Islands and Parrsboro. Spend a couple days rockhounding, camping, learning about dinosaurs at the Fundy Geological Museum. Continue along the coast to Joggins, where you can see some of the world’s best fossil cliffs. From Amherst, return to Halifax on the main highway or, if time allows, take in some of the beautiful beaches around Pugwash and Tatamagouche on the northern shore.